Just as all your customers Electrical needs are unique, so are your NH Electrician Insurance needs. What services you offer customers can determine what NH Electrician Insurance you will require and can drastically change the cost of your insurance. 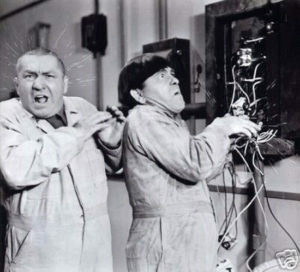 We want Electricians like you, not these stooges! Don’t Worry, Germain insurance has your back and can help with all your needs. What NH Electrician Insurance coverage’s do you need? The first policy you will need is a NH Electrician Insurance general liability policy, the typical limit of liability is $1,000,000 although you can get less it really will not save you much money. The next on the list is your equipment. Don’t be fooled your equipment is not covered unless you have New Hampshire Inland Marine Insurance coverage. With the cost of tools and diagnostic equipment, you want to make sure you are insured in case someone decides that they want your stuff more than you. Getting a quote for your NH Electrician Insurance is simple, either give us a call (603) 606-1895 or fill out the “request a quote form below” we look forward to hearing from you.